My grandma Mary made the best Giambotta, and to me, nothing says summer more than a big bowl of Giambotta and a chunk of crusty Italian bread. 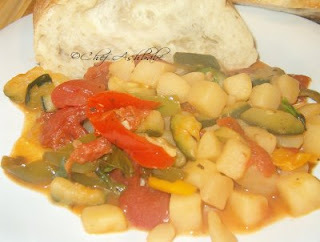 Giambotta is Italian vegetable stew, made with zucchini, potatoes, tomatoes, peppers, garlic and basil. Clean, skin and chop all the vegetables into uniform dice. To skin the tomatoes, bring a large pot of water to a boil. Hold each tomato with a long meat fork and submerge into the boiling water. Hold in the water until the skin bursts, about 10 seconds. 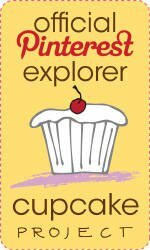 Remove from boiling water and place in ice water immediately. The skin should peel right off. Peel, chop and seed the tomatoes. In a large saucepan, heat the olive oil over medium heat. Saute the onion and garlic together until soft. Add the tomatoes, raise heat and bring to a boil. Stir in the diced potatoes and lower heat to a simmer. Cook covered, until vegetables are almost tender. 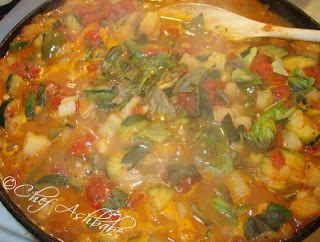 Add the zucchini at the end and simmer the vegetables a little longer until they are all soft. Add the basil and season with salt and pepper. Serve as a side dish with meat or as it's own meal with some good crusty bread. 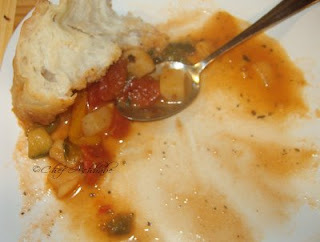 As you can see, this was a really good vegetarian dinner tonight.. all on it's own with some good Italian bread. Even P. went back for seconds!